My mum is my emergency contact. An on-call babysitter. My unwitting fashion inspiration. She also happens to be the person who dragged me kicking and screaming out of a shopping centre in 1997, and still won’t let me forget it. This month, I’ve been working with Snapfish to create some unique Mothers’ Day gifts that will make up for that almighty tantrum, and digging through the albums of years gone by has given me a new level of appreciation for her. I’ve never been one for a soppy Facebook post, I rarely stretch as far as a birthday collage, but my mum deserves more credit than I have ever publicly given her credit for, and with Mother’s Day just around the corner, it’s time for that public declaration of appreciation. I don’t think twice when I put my mum down as my emergency contact. By definition, I’m a grown up now, I have a child of my own, but for now and forever more I’ll always expect her to be the first one by my side if I broke an arm. Aside from the fact she is more likely to answer her phone than my boyfriend, she’s also the person I would trust the most. A mother/daughter relationship can be a funny one, especially as adults. The forced interactions we grow up with are less forced, and suddenly we get to choose the kind of relationship we have. The roles of taxi-driver, personal cleaner and health practitioner fall away and suddenly we find ourself in the territory of friends, confidants or distant strangers in some cases. I've been lucky. The only thing we’ve disagreed upon on in adulthood is me getting a dog. Funnily enough, I got the dog, but she was right and I should never have gotten the dog. It’s a perfect representation of our relationship - she will always think she knows better, I won’t listen, and nine times out of ten she knew better and I should have. It’s something I resented as a child, but as I’ve grown, I’ve began to take comfort in knowing that she will always be there to remind me that I am not ready to commit to daily dog walks at 6am. She’ll be right, I’ll be wrong, and there’s nothing I can do about it. Now, is there an easy way to convey that in a two-liner in a Mother’s Day card? Probably not. But a personalised one is the best place to start. I’ve used Snapfish for years, but notably last year to try and come up with a gift somewhat more substantial than socks for Fathers Day for my partner. I gave in and went with socks too, but have a guess at which gifts are still proudly displayed on the mantel and which have a hole in the toe and are now omitting a questionable smell? I’m now a personalised gift convert, and Mother’s Day will be no different. Can I thank my mum for the endless taxi-rides and for hand-knitting me at least fifty scarfs with cheap perfume and boxes of Maltesers? Doubtful. 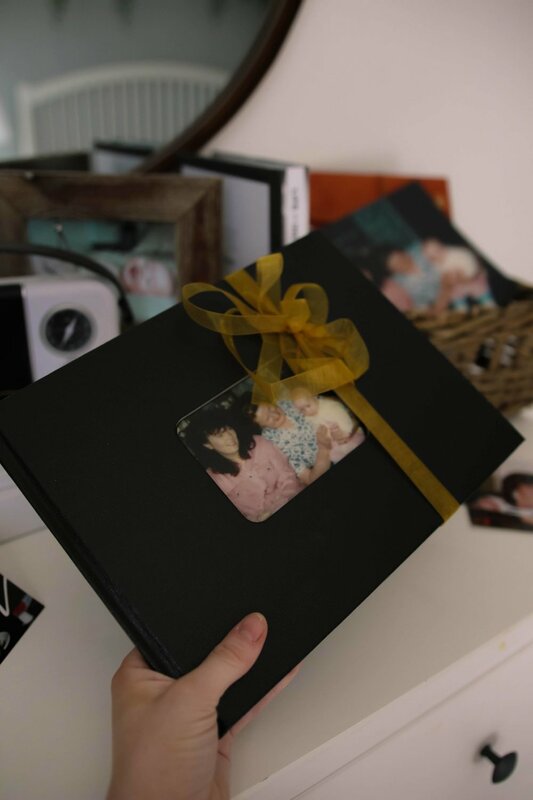 But a personalised book with her favourite memories and the pictures that make us all smile? - that might be a start. I love old pictures. I love seeing my mum in what she would call her prime. The days of perms, girls holidays and too much wine (not everything has changed), before her days descended to nappies and nursery runs. I loved digging through the old albums to create something with all of my favourites of her. Not just those with the two of us, but of the person she was before she ever became my mum. As per usual, creating an entire photobook of these memories was made super-simple with the set up on Snapfish. I wanted something really simple this time around, with a focus on the dodgy perms and without taking away from the old photos. They have an easy builder that can import from Facebook, Instagram and Google Photos, and I then mixed these with pictures taken of old pictures. With the option to have it bound in leather, it made the perfect keepsake, something she can tuck away and that will hopefully give her the warm and fuzzy feels as she flicks through her days gone by. I love to look back on old memories, and I know that she does too. It’s one of the many ways that we’re similar. We’re also both coffee fiends, level headed and as well-spoken as Glaswegians come. But then in more ways than one, my mum is a better person than I am. She puts everyone else before herself, forever ensuring everyone else’s happiness before her own. It’s the reason I like to go that little bit further for Mothers’ Day. Her selflessness is something I never noticed as a child, blind-sighted by the very fact that she was just my mum. Now I see that she was more than just my mum, she was the best mum I could have ever had. As I've grown up, our relationship has changed from needing her, to wanting her, to phoning her three times a day to discuss my inability to keep my plants alive or to tell her what I’ve had for my snack. There was never any danger of our relationship boiling down to a single Sunday night catch-up phone call. When the teen angst, childish dependence and ongoing battle for room cleanliness were no longer the basis of our daily interactions it was easy to see that the two of us just got on. I gained a whole new level of appreciation for her when I became a mother. She was my go-to, my shoulder to cry on and an over eager babysitter. I look at her with my own son, and I find it difficult to stretch my mind to think of a time when she would have ever struggled. I can only ever remember her having everything under control. To me, she ran a tight ship, but then, she’ll remind me of the tantrum I had at two years old in the middle of Safeway, and take me back to a time when she too didn’t have it altogether. It didn’t scar her too badly though, as her grandchild is the apple of her eye. It wouldn’t be Mothers Day if I didn’t get her a keepsake of Harrison, so I put together a wooden-block desk calendar that looked as though it cost a whole lot more than it did. She likes me, but not enough to have a twelve month calendar filled with pictures of my face. Harrison? Harrison is a different story. They say we love our kids, but we are in love with our grandkids, and I am almost certain this is the case here… I tend to find that the prices are always really affordable, but Snapfish also have a discount code in the run up to Mothers’ Day - you can get 40% off your order using the code HEARTMUM40. My mum deserves more credit than I have ever publicly given her. I am forever envious of her her ability to put everyone else's needs before her own, I am thankful knowing that when I’m fifty years old there is a very good chance I’ll look like her. I can rest easy knowing that she’ll never have made it through six paragraphs of mine - she’s open in the fact that she thinks my writing is too long and rambly to ever to stick with to the end - and that’s fine. It works in my favour right now, as I can continue existing in my seemingly nonchalant fashion and my gifts will stay under wraps. But this post, and my personalised gifts, are my nod to her, a thank you for just being my mum.